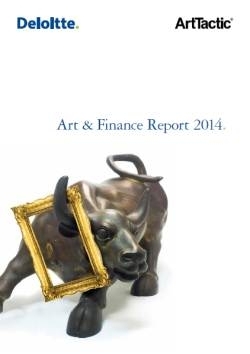 ArtTactic in partnership with Deloitte Luxembourg is delighted to present the 3rd edition of the Art & Finance Report 2014. The findings of the Art & Finance Report 2014 show that the wealth management industry is taking a more strategic view on art as an asset class. Equally on how wealth management can be used as a tool to build stronger and deeper relationships with clients. Thus reflecting an increasingly competitive marketplace. Notably, this year’s findings suggest that art buyers and collectors are increasingly acquiring art and collectibles from an investment viewpoint. 76% said so this year, compared with 53% in 2012. This will most likely increase the need and demand for professional and wealth management services. Services relating specifically to the management and planning, preservation, leverage and enhancement of art and collectible assets. Particularly interesting to see is that the wealth management community is already responding to this new demand. 88% of the family offices surveyed said that estate planning around art and collectibles is a strategic focus in the coming 12 months. Additionally, 64% of the private banks said the same.